Anand (“Bliss”) is as happy a movie about terminal illness as you’re likely to find. Nevertheless, this classic Hindi film raises interesting questions about how healthy people should interact with the sick, and whether preemptive grief makes things worse. The story unfolds through the diary entries of Dr. Bhaskar Banerjee (Amitabh Bachchan), a thirty-year-old cancer specialist who’s already overwhelmed by the amount of death he’s seen in his career. His own sense of futility — “Oh, God! Such frightening helplessness.” — makes him persnickety with his patients. He sees no point in giving them false hope. Being a bachelor, Bhaskar is the logical choice to host Anand (Rajesh Khanna), a friend of a friend who wants to tour Bombay. Bhaskar and his friend and fellow doctor, Prakash (Ramesh Deo), are tasked with treating Anand, who’s suffering from terminal intestinal cancer. Anand talks non-stop, joking with friends and strangers alike. Such relentless cheerfulness would normally grate on a man as taciturn as Bhaskar, but the doctor sees the melancholy behind Anand’s permanent grin. While the most obvious message in the movie would seem to be “live each day to the fullest,” a more interesting theme relates to how healthy people are supposed to interact with the terminally ill. Anand knows he’s dying, yet he chooses to remain upbeat. He’d rather have fun while he’s here, and he wants his friends to be happy when they’re with him. At one point, Anand threatens to leave rather than endure anymore of Bhaskar’s forlorn looks. The film makes a persuasive case that the ill have the right to dictate how they are treated by others. Just because our own inclination may be to mourn what we know we will lose, it doesn’t mean we should subject the person who is dying to those feelings. More than forty years after its original release, the shots of Mumbai (then Bombay) make the city look like a very cool place to be in the early 1970s. Bachchan looks dashing, and the furnishings in Bhaskar’s house are fabulous. The only aspects of Anand that don’t really translate to the modern-day are its aggressive musical cues (though plenty of directors still rely on them). Any time Anand gasps for breath, the sounds of an orchestra blare to ensure the audience knows that the moment is significant. The effect is more shocking than instructive, especially in cases where the music intrudes on an otherwise quiet scene. The relatively small cast delivers great performances, particularly in regard to the way they react to Anand’s sickness. Bhaskar’s beloved, Renu (Sumita Sanyal), is rock steady, while Prakash’s wife, Suman (Seema Deo), loses her courage. Bachchan keeps the core of Bhaskar intact, opening him up to Anand — and the world — gradually. 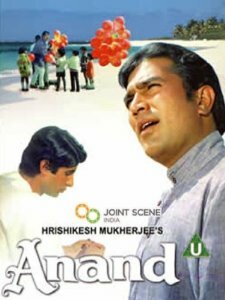 While playing a character who’s described as a “tornado,” Rajesh Khanna carefully ensures that Anand feels realistic, rather than like some outrageous film creation. Anand is fun-loving, but not a clown. He has moments of melancholy, but he’s not harboring a dark secret. He really is just a guy who wants to be happy while he can. Thanks to fine performances and a charming lead character, Anand is easy to watch and enjoy. This entry was posted in Reviews and tagged 3.5 Stars, Amitabh Bachchan, Anand, Bollywood, Hindi, Movie Review, Rajesh Khanna, Ramesh Deo, Seema Deo, Sumita Sanyal on March 21, 2014 by Kathy.